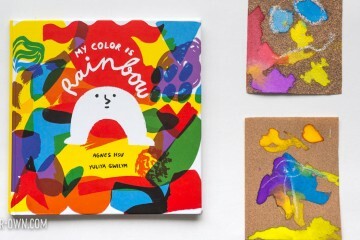 This is a project that could include varying levels of child involvement depending on their age and skill level. It may just involve playing in the costume! Purchase or re-use a t-shirt to use as the body for your bird and the “base” for your wings. Have your child lie down over tracing paper (with their arms outstretched) and draw out a basic shape for one wing based on his or her size. (This will attach to the shoulder portion of the shirt, down to the sleeve end. However, as seen in the photograph, the tip can extend further based on your preference). 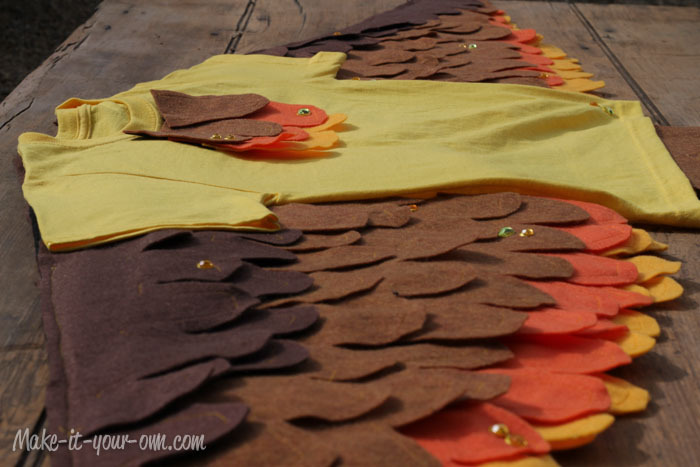 Cut out the tracing paper wing and pin onto a sturdy fabric (we chose felt). For symmetry (and ease) it is suggested that you fold over the fabric that you use to make two wings at a time (flipping the second wing over so it folds out the opposite way). It is suggested that you make two separate wings rather than one large set of wings so as to distribute the weight onto the t-shirt. You can attach the fabric with an adhesive (bought from a fabric store) that comes in a roll and is activated with the heat of an iron. If you chose this option (for limited sewing), be sure that your felt is not synthetic as it may melt. Chose a wool based felt. 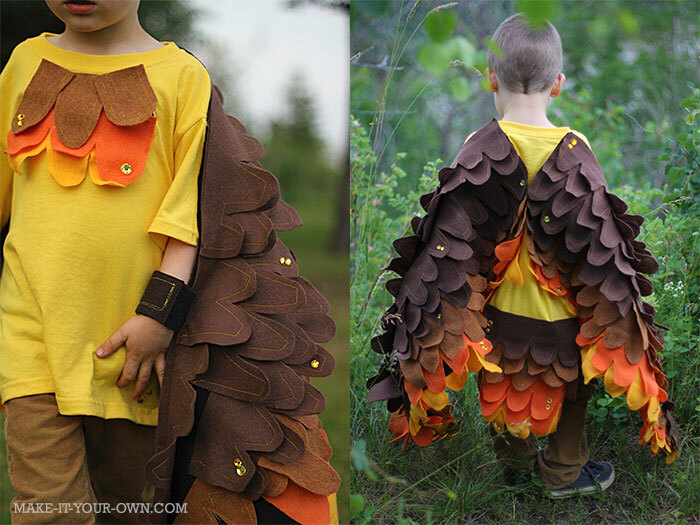 If you feel like your child would be quite active in the costume you can also sew the wing bases to the shirt. We did a combination of both. Depending on the type of bird you chose to make, cut out a base for the tail. We decided to use felt for our costume. 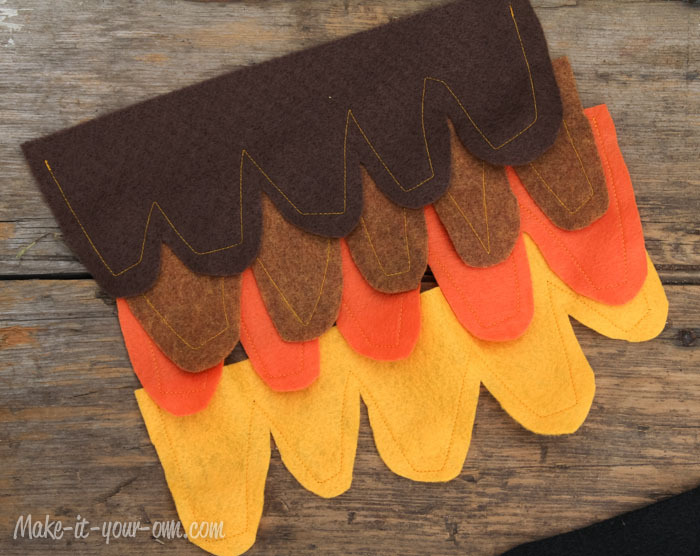 We purchased felt sheets (letter size) and cut out rows of feathers. We have provided a simple template for inspiration. For efficiency, we folded the sheet in half and cut out two rows at the same time. This was aided by a sharp pair of sewing scissors and required some slight touch-up cutting following. We then sewed a basic stitch around the feather (using the sewing machine foot as our guide) to provide detail/interest. You could embellish the feather rows with a variety of techniques (such as sewing a double line down the centre, or sewing the shaft and barbs). We’d love to see what you came up with! 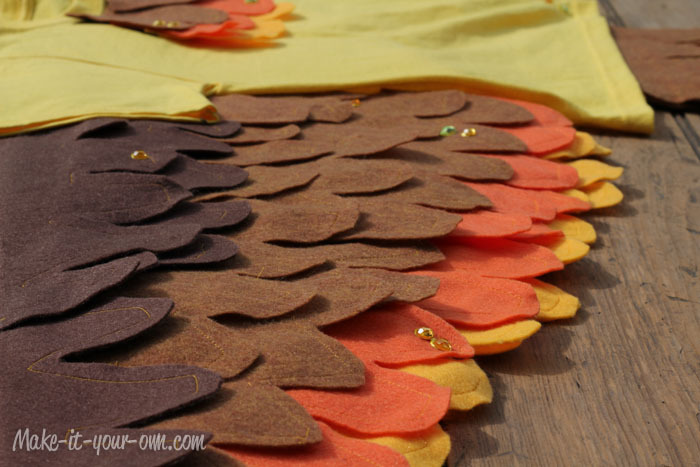 We chose to use yellow, orange, light brown and dark brown feathers. 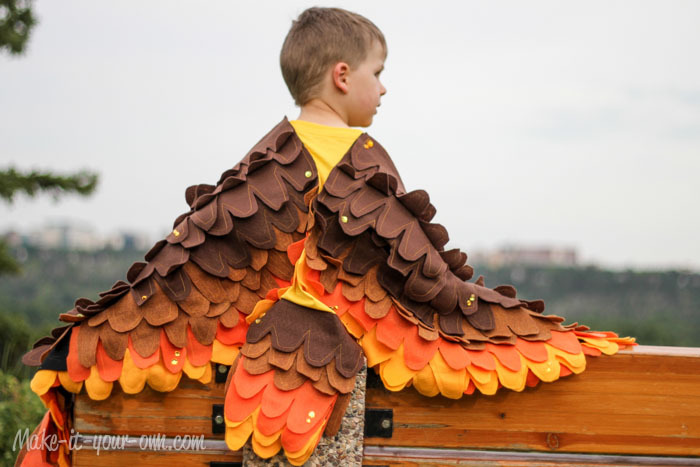 Based on the size of our son, the t-shirt used and the size of the wings we used approximately 15 sheets of the yellow (making 2 rows of feathers each), 15 sheets of the orange felt, 15 sheets of light brown felt and 20 sheets of dark brown felt. It is always advisable, however, to purchase several extra sheets to allow for a margin of error. We then started with the bottom feathers and glued them in layers (using fabric glue purchased at a craft store). Before starting your gluing, you may want to arrange your rows to see how they may fit. You may have to trim some of them, tuck them under each other or overlap them. 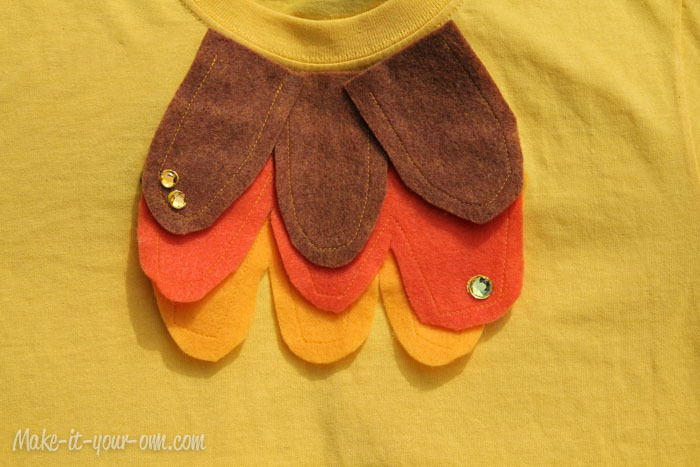 Around the neck (breast type feathers), glue on single feathers to fit the curve of the t-shirt. We then did a simple embellishment on the feathers to add interest using craft gems, glued on with fabric paint. 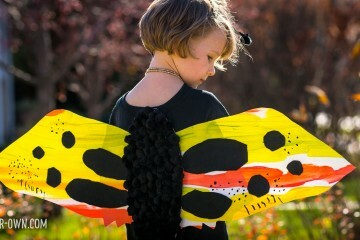 Have the child try on the costume to measure where to put the wrist bands to control the wings. 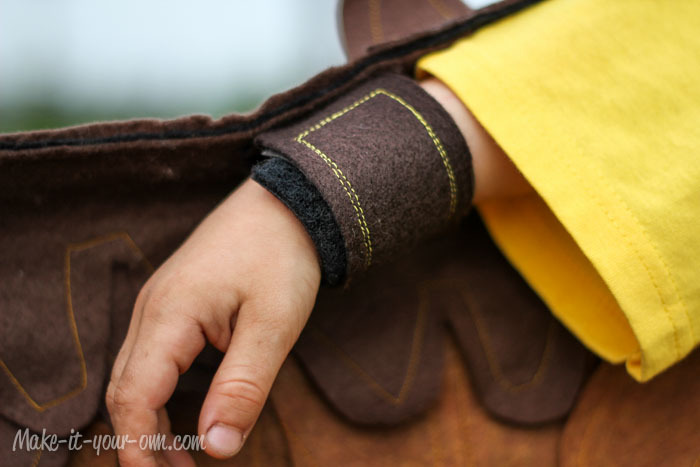 We took a strip of fabric and sewed on Velcro (be sure to pin it on and test that it will wrap around to match each other, before sewing or gluing it on). Then sew or glue it to the interior of the wing at the appropriate spot. Hope you have a “hoot” with this idea. We would love if you shared a photo of your finished work with us! Developing planning skills, creativity and fine motor skills. Transferring/ recreating visual knowledge into a physical form. Be sure that scissors, sewing machine and iron are used with adult supervision.